The former Tiger Stadium site in Detroit received the city’s first modular home drop today as part of a mixed-used development at Michigan and Trumbull called The Corner. The $30-million project, which will feature 111 apartments and 26,000 square feet of commercial space, will be completed in February. The project by Larson Realty Group in Bloomfield Hills, the Urban Land Institute, Champion Commercial Structures in Troy, and other development partners, made use of modular design and construction of the residential units to reduce construction time, costs, hazards, and logistics challenges. The modular units were manufactured in a controlled environment and delivered to the site with interiors fully complete and stacked in place. The drop represents a major construction milestone for The Corner, which will transform the storied site into an activated, shopping, dining, and residential mixed-use development that reflects Corktown’s vibrant atmosphere and history. 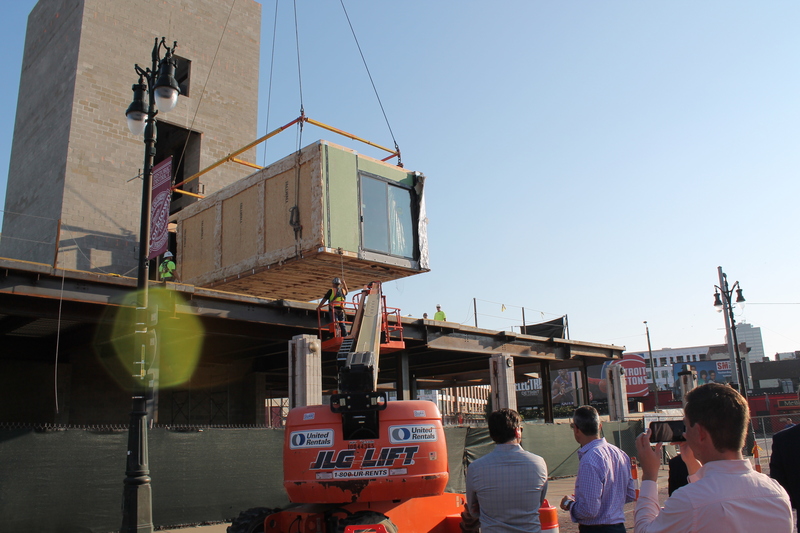 The modular apartments include studios, one-bedroom, and two-bedroom units, with an average size of 700 square feet. The project supports the city’s efforts to provide affordable and accessible options for both residents and businesses, with 20 percent of the apartments geared toward renters whose incomes are no more than 80 percent of area’s median income. Additionally, 60 percent of the retail space will be leased at half the current market rate to provide access for small Detroit based businesses. The apartments, which front both Michigan and Trumbull, will have rear balconies and rooftop decks that overlook Detroit PAL’s new $20-million baseball field that offers the same dimensions as the original playing field, complete with the center field flagpole. The complex offers youth enrichment and workforce development programs, while the field hosts baseball, softball, T-ball, coach pitch, football, soccer, and more. The retail space will span across both streets, and the development team is looking for a restauranteur to fill the space at the corner of Michigan and Trumbull. Stokas Bieri Real Estate in Detroit says the restaurant space will include room for sidewalk seating. The Build Institute, a nonprofit organization in Detroit, will occupy 4,000 square feet of space at The Corner. New condominiums also are planned for the development. Hosted by ULI Michigan, the modular drop event featured many of The Corner’s partners, including Rossetti Architects, O’Brien Construction Co., the city, Detroit Economic Growth Corp., Capital Impact Partners, Clark Hill, Community Capital Consulting, The Enterprise Securities Co., First American Title Co., Giffels Webster, Goldman Sachs, Gyro Design, Honigman, Invest Detroit, Klokwerks, LISC, MJBennett, Pappas Financial, Plante Moran, ROK Construction Services, SME, and Village Green.